I have encountered Joe Odagiri when I read about him playing a very unique roles in a movie. Since then, he has been selected and playing a various roles with a very outstanding performance. Despite his not so popular among young viewers ( an under rated actor I agreed) whom rarely knew him, he is one a a very talented actor out there and he will be go up further because of his pure talent and versatility. 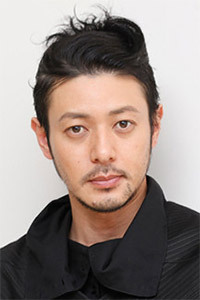 I have watched a lot of Japanese actor, but he and Takuya is one of a few outstanding and impressive actor out there. Joe, indeed will be continuing shining with his extremely excellent talent. how did i describe the feeling when i saw his eyes on screen? it was definitely a shock!!! what a goodlooker with perfect acting! soooooooo talented, he has a magic power to grasp people's eyes at first sight! Odagari Joe would absolutely be part of backbone in Japanese TV shows and movies, furthermore i assume that being a super movie star seems to be much easier for Odagari Joe, such a gifted actor! as the proud of Japan, Odagari Joe's performance deserves to be kept eyes on! Mr. Jo-Jo Odagiri. I thought he was the most gorgeous guy I've ever seen on the T. V. screen. Then I started watching a couple more of his films thats when I saw that he not only had the looks but He could act really well. Love him a lot since Kamen Rider Kuuga! A very talented actor... Always act very good in every movie/dorama he played. Very successful in playing different characters. Can't wait to see his next project. He's so charming, handsome and georgeous. He is very talented actor, I love his funny character in satorare and the outstanding performance as a bishounen psycho in azumi. I always remember him as kamen Rider kuuga- the most gorgeous Kamen Rider ever. But now I will always see him as a good actor and not just another pretty face. GO JOE!! Joe is one of the most talented actors i know. It could be enough to vote for him. But he is also very handsome man. from movies to dramas, he simply dazzles in everything that he is in! Joe Odagiri is BEAUTIFUL! great actors. can have many characters in different dramas. I'm totally impressed to see his acting in Satorare. It's amazing! my favourite actor so far.Even if I just watched 1 movie with him..But his perfomance in Azumi was just unspeakable, awesome! Versatile and hunky. This guy could act!!! Laughed and cried with him in all the doramas that I watched. Yay, I finally found the vote button...oh hello I'm am a totally psycho fan fo his beautiful self. i know him bcos of kamen rider kuuga!!! wow... wat a great kamen rider!!! he's a good actor!!! Bad photo above. But he's so very nice to look at as Saito Hajime in "Shinsengumi!" another actor that needs no explanation why i voted for him!! simply amazing!! captivating, very talented actor (he made me cry in satorare)..he's my type. Japanese Johnny Depp? But somehow more approachable. Spiffy hair.